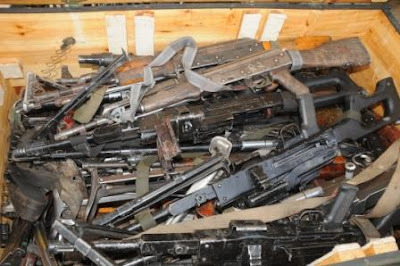 The Commissioner of Police in the FCT, Sadiq Bello, said the Command has arrested three suspects in connection with an illegal firearm fabricating factory in Shenagu village near Zuba, FCT. The suspects are: Philip John, owner of the factory, Onyegabueze Okpara, supplier of ammunitions and Joseph Bulus, distributor of the arms. Mr. Bello made the disclosure while briefing journalists on arrest by operatives of the command on Friday in Abuja. He said that items recovered from the suspects include: locally fabricated revolver pistol cylinder, four Dane guns, one double barrel gun, one single barrel gun, two calibre live cartridge and six Dane gun muzzles. Others are: four single barrel muzzles, six barrel gun frame, two gun muzzle spring, one manual motor drill, one dice for retread and various implements used for manufacturing locally made weapons. He said that during interrogation, Mr. John confessed to have been in the illicit business for 17 years and selling the fabricated single-barrel guns and Dane gun for N20,000 and N10,000 respectively. The commissioner said that Mr. Okpara, who disguises as a bicycle spare parts dealer was arrested at Kaita market with the items which he concealed and sold to criminals. He said that Mr. Okpara had been in the illicit deal since 1997, sells a pack containing 25 pieces of live cartridge for N12,000, while single cartridge goes for N500. Mr. Bello said that Mr. Bulus, the major link, who connects the principal suspect, Mr. John, with potential buyers of the fabricated firearms, was arrested in Zuba. He said that the suspects would be charged to court on conclusion of investigation. Mr. Bello said that the command also arrested five armed robbery suspects at Apo roundabout and Kabusa areas of the FCT. The suspects are: Hashiru Isiaka, 30, of Kuruduma, Umar Adamu, 20, of Area 1 Garki, Tukur Bala, 25, also of Area 1 Garki, Bashiru Mohhamed, 25, of Durumi and Benjamin Jatau, 29, of Kabusa. He said that Mr. Jatau was arrested by operatives of the command on Sept. 15 during a stop and search at Dantata Bridge in Jabi. Bello said items recovered from the suspect are: one revolver pistol with two rounds of live ammunition, one revolver pistol and one locally made pistol, Nokia cell phone, Indian hemp, charm and screw driver. “The exhibits were discovered by the police during a search conducted on the bag the suspect was carrying while on transit from Jabi to Kabusa in a tricycle,” he said. He said that the suspect, an ex-convict, confessed that the guns, which he bought for N50,000 was to be used for a major robbery operation around Kabusa and environs. “The suspect and exhibits have been transferred to the command Special Anti-Robbery Squad (SARS) for discreet investigation and prosecution,” he said.